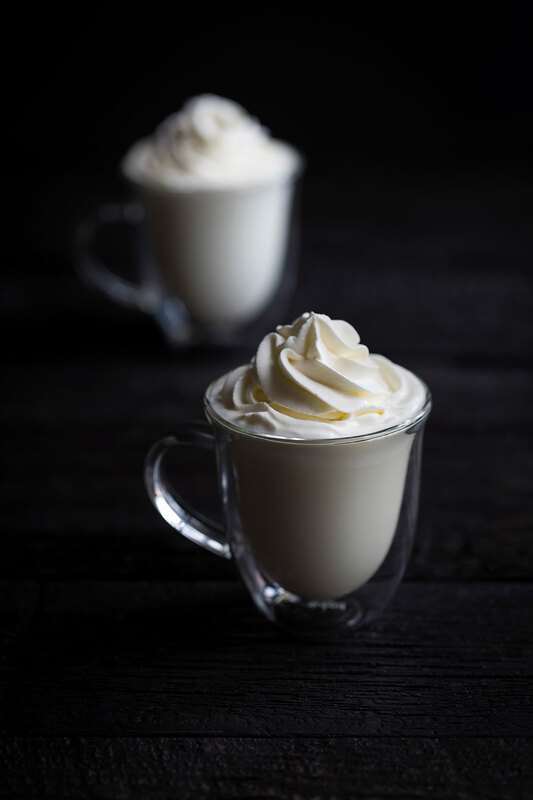 Sweet, decadent and creamy, this white hot chocolate is a cozy treat all year long. For a special adult touch, try adding a splash of liqueur like Baileys, Kahlua or Rumchata. For this hot chocolate recipe, you’ll only need three ingredients: good quality white chocolate, milk, and vanilla. The rest is optional! I often hear people say that they don’t care for white chocolate. Trust me, I understand. It wasn’t long ago that I also considered myself to be kind of a hater. The truth is that, just like with many other foods, not all white chocolate is created equal. And if I’m being perfectly blunt, most white chocolate is kind of gross. Good quality white chocolate, on the other hand, is fantastic. 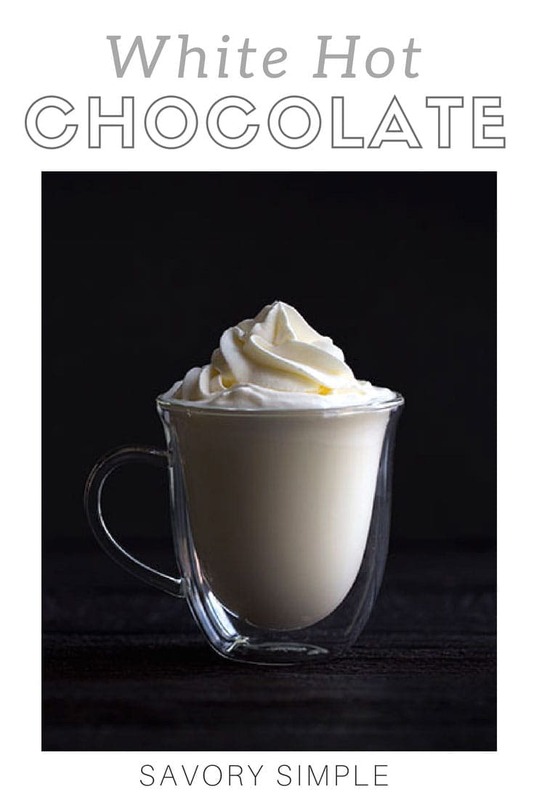 Ultimately, the type of chocolate you use in this white hot chocolate recipe is what will make all the difference. What is the best white chocolate? “The best” anything is always going to be subjective. Cook’s Illustrated ran a taste test in 2009, and Guittard came out on top (2009 is obviously a bit dated, so take those results with a grain of salt). In my opinion, the easy winner is once again Valrhona. I realize that’s becoming a theme around here. A few months ago, I bought some of their white chocolate baking chips while stocking up on supplies, and I haven’t looked back since. I honestly wasn’t expecting much, but I now love snacking on a couple of them as a late night treat. They are smooth and creamy; the perfect “melt in your mouth” chocolate, and I personally don’t find them to be too sweet. These baking chips are what inspired this recipe. I think we can all agree that the worst white chocolate is cloying beyond belief. Who wants to make hot chocolate out of that? This is a very straight forward recipe, but it can be easily customized to your personal preferences. Use whatever milk you have: whole, low-fat, skim, nondairy, etc. 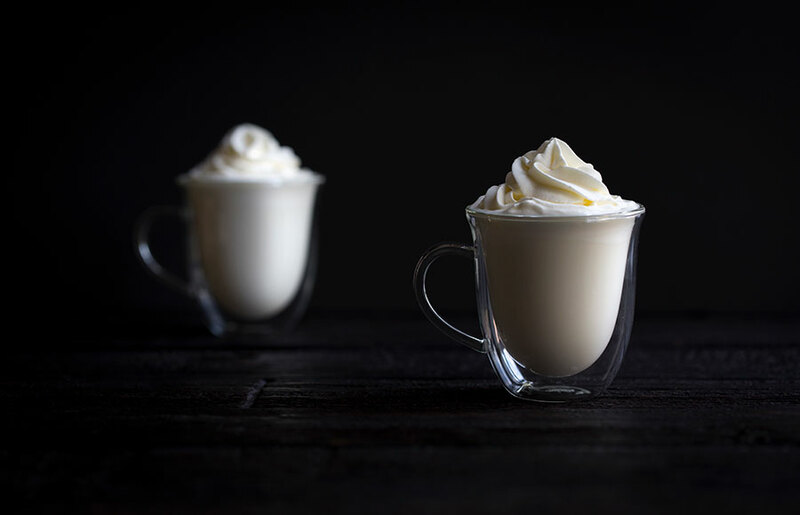 For more decadence, add a splash of cream or half-and-half! Don’t leave the saucepan on the stovetop longer than necessary, and don’t boil the hot chocolate. You’ll be serving it right away, so just bring it to barely a simmer. If you like mint chocolate, you can optionally add a small amount of peppermint extract at the end, after removing the hot chocolate from the heat. Peppermint extract is stronger than vanilla extract, so start with a small amount (about 1/4 teaspoon) and add more to taste if desired. For an adult treat, try adding liqueurs like Rumchata (my favorite), Grand Marnier, or Chambord. Remember that the hot chocolate is sweet and so are these liqueurs, so don’t go overboard. If you don’t want to add additional sweetness, consider adding something like spiced rum instead. Whipped cream is an excellent topping. So are mini marshmallows, especially if you toast them first! You can toast them carefully under the broiler, or use a brûlée torch if you own one. But I still think I hate white chocolate. Can I use “real” chocolate in this recipe? You totally can. Just keep in mind that you might need to add some sugar, depending on how sweet you like your hot chocolate. If you use semi-sweet or milk chocolate, you might not need to add anything since those are also fairly sweet. You may want to add a sweetener if you use bittersweet chocolate. Light agave nectar is an excellent, neutral-flavored liquid sweetener to keep on hand since it doesn’t need to dissolve like granulated sugar. You can always stir that in at the end to taste. Granulated sugar will work fine as well; just taste the hot chocolate before serving, and if needed, whisk in a few teaspoons of sugar so that there’s time for it to dissolve while it’s still heating on the stovetop. Love this recipe? Be sure to also check out my Hot Buttered Bourbon and Hot Chocolate with Whipped Cream Melting Hearts! 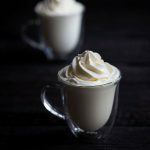 This sinfully delicious white hot chocolate recipe is incredibly easy to prepare at home! If you’re feeling extra decadent, add a splash of heavy cream along with the milk. In a medium-sized saucepan, combine the milk, white chocolate and vanilla. Stir over medium heat until the chocolate has melted and the mixture is just simmering, 3-5 minutes. Remove from the heat and stir in any optional add-ins, if using. Pour into mugs and top with whipped cream or mini marshmallows, if desired. Serve immediately. Peppermint extract is very strong, so go light at first. I’d start with 1/4 teaspoon and add more if desired, 1/8 - 1/4 teaspoon at a time. You can go heavier on the alcohol (around 2 tablespoons). I like adding liqueurs such as Rumchata, Baileys, Grand Marnier or Kahlua. You could also try adding a splash of spiced rum! Totally need to try this one.. it is right up my alley!! 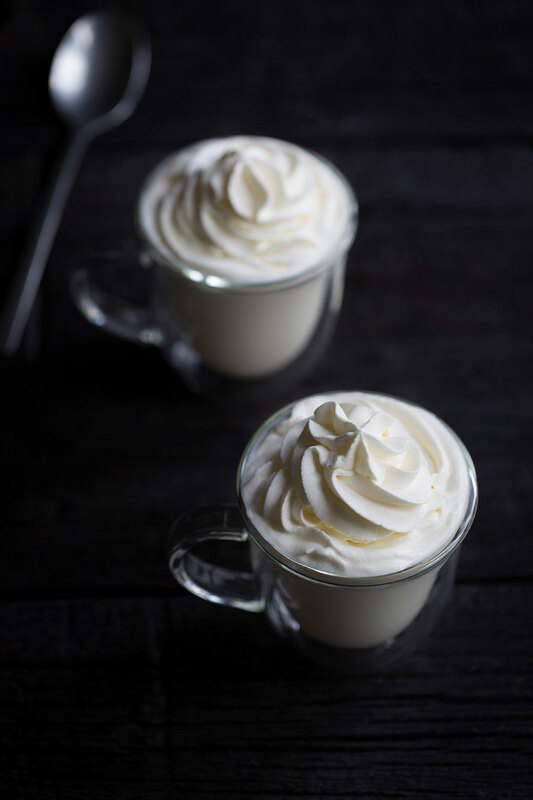 This white hot chocolate is the perfect way to warm up on a cold night! Looks so cozy and delicious! This looks like one decadent winter beverage. Count me in for a cup or two! I love Valrhona chocolates. And have to agree with you. Most other white chocolates are kind of gross. This looks delicyand intriguing. Definitely going to give it a try. I love a good hot chocolate, but white?! YES PLEASE! Totally agree that quality makes all the difference! I’d happily sip of this beauty of a drink! I really wish I had a cup of this right now!! What a simple and beautiful drink! Such a treat! So awesome, especially with a little Bailey’s in this! Delicious with a hint of cinnamon on top. Such a wonderful taste, and oh so rich. Just made it for my husband we both loved it very much.